Melett Limited: Founded in 1995, Barnsley based Melett Limited is the market leader in replacement turbocharger parts for the global independent aftermarket. By delivering the highest standards of quality parts and service, Melett has helped the world’s professional turbo reconditioning industry to grow. Currently, Melett offers a range of over 2450 part numbers covering all of the most popular turbo models and many less common models. The company’s extensive range includes complete balanced core assemblies, along with individual piece parts, oversize parts, upgrade parts and repair kits. The company also provides an extensive range of major components, including turbine and compressor wheels, bearing housings, seal plates, heat shields, variable geometry nozzle ring assemblies, plus a large selection of oversize journal bearings and piston rings. Melett insists on applying quality control procedures similar to those utilised by OEM automotive component manufacturers. Production Part Approval Process (PPAP) documentation is supplied with deliveries giving accurate measurements of critical dimensions of control samples from each batch. To enable the accurate manufacturing of parts, Melett regularly invests in the best available measuring instruments. 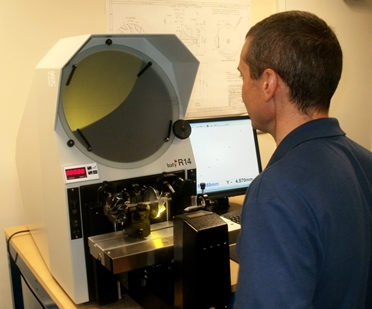 Having identified the need for two, high-precision optical projectors for the company’s busy Goods Inward Inspection and Engineering Departments, Mark Tindall, Melett’s Senior Development Engineer, recently embarked on a search for suitably precise instruments. Having considered the offerings from several alternative suppliers, Mark purchased two R14 profile projectors from Baty International. Mark explained “Given the tight tolerances of many turbocharger parts, when deliberating our choice of optical projector, our main concern was the accuracy and repeatability of the units on offer. In addition, given the volumes of work passing through our Goods Inward Inspection and Engineering Departments, ease and speed of use, together with the provision of a high-quality reporting function were also important considerations. “As Baty International’s R14 scored highly in all of these areas and as it also delivered the best price to function ratio, we were happy to purchase two units, both with Baty’s easy to use Fusion 2 PC based measuring software. Baty’s popular R14, bench-mounted profile projector combines high accuracy non-contact measurement with a generous measuring range. R14 projectors can be supplied with a choice of digital readouts and optional automatic profile edge detection. The projector’s horizontal light path configuration is ideally suited to machined parts that can be secured to the workstage with Baty accessories, such as the turbocharger components now being measured by Melett. In addition to use within areas such as inspection departments, the R14’s compact shape and robust construction makes it the ideal projector for workshop environments. To enable the delivery of a projector to suit all customers, the R14 is available in three specifications, from a simple 2 axis digital readout for X&Y measurement, to models with a screen mounted automatic profile edge sensor, incorporating geometric functions such as skew alignment, angle radii measurement, pitch circle diameter and construction of intersect points. Baty’s feature-rich, easy to use Fusion 2, PC based measuring system has full geometric functionality. It also allows graphical views of measured parts to be printed as a fully dimensional drawing including geometric tolerances. Further available graphics include form error and SPC charts. Fusion’s comprehensive reporting capabilities also gives access to tabulated details with pass / fail analysis, auto-link to Excel™ and auto sequence programming features. Having built an enviable reputation as one of the world’s foremost designers and manufacturers of Co-ordinate Measuring Systems and Profile Projectors, Baty International now boasts a comprehensive range of high quality projectors, including bench top and floor standing models, in both vertical and horizontal light path configurations. In addition to being thought of as traditional, high precision optical comparators, Baty’s renowned profile projectors are also regarded as extremely effective, non contact 2D measuring systems by their loyal, global user base. For more information on the Baty R14 Profile Projector click here.